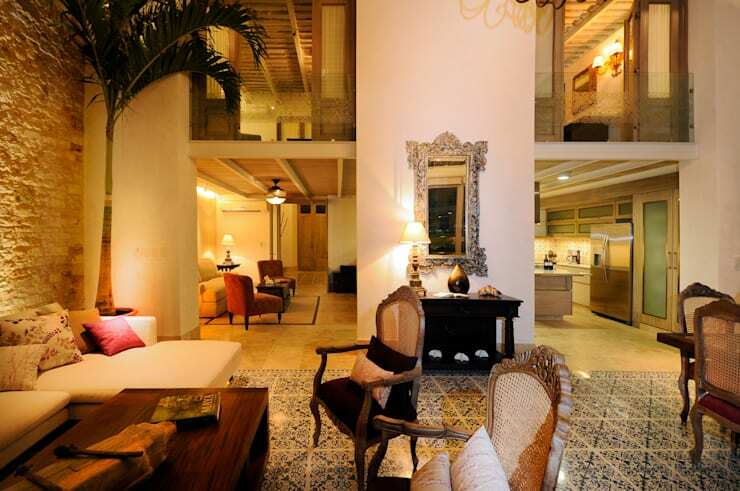 Welcome to the lively world of Mexico, which is our location for today’s homify 360° discovery. But it’s not the widely varying topography, sombreros or Margarita recipes we’ll be viewing, but instead a supremely spacious and very elegant house known as the House of Sirens. There is nothing we don’t love about this exquisite living room; however, one of the things we are crazy about is the way in which it combines various textures for a striking visual effect. 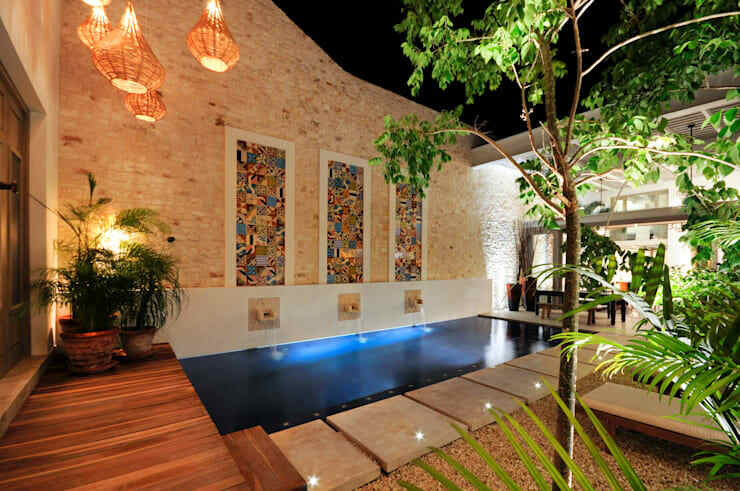 Just see how it blends a rustic stone-clad wall with an unusual decorative panel, beautiful blue floor tiles and a fresh, tall palm tree. When it comes to the furniture department, we find a mix of modern and vintage, with an ornate mirror on a snow-white wall being especially eye-catching. Locating the kitchen, we find that it’s one of the more modern rooms in the house, yet it too provides a firm dose of detail and pattern. Equipped with shiny chrome appliances and furniture decked out in neutral hues, this kitchen looks set to help conjure up a myriad of dishes, plus presents a most stylish and welcoming space for socialising. 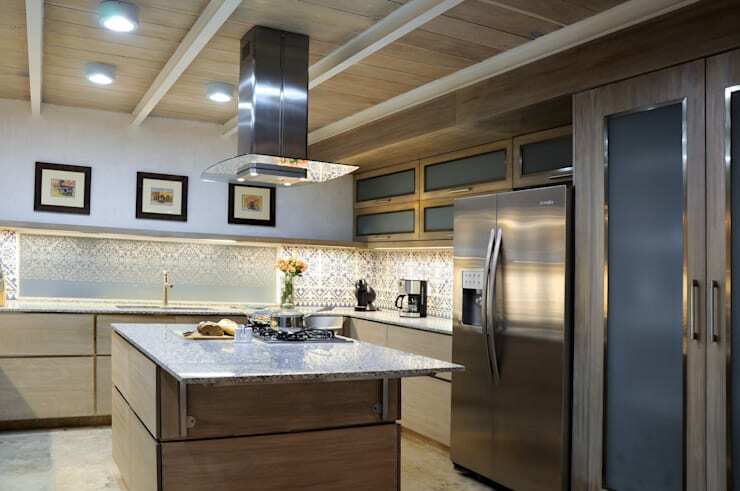 Smooth cabinets and drawers take care of all storage needs, while the decorative tiles on the backsplash and the timber-clad ceiling bring forth the necessary detail. How do you make up a dining room so that it appears both classy and comfortably warm? By populating it with stylish and vintage wooden furniture, of course. 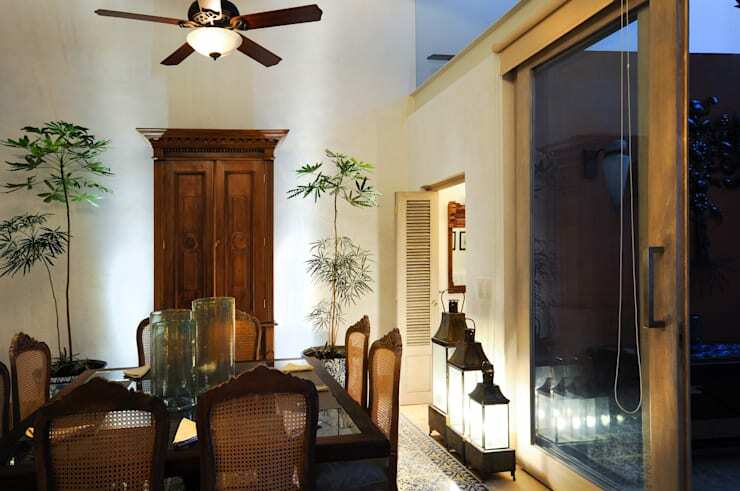 In addition, this dining area also opted for antique lanterns and white walls to add a soothing sense to the space. A handful of potted plants ensure a touch of freshness. 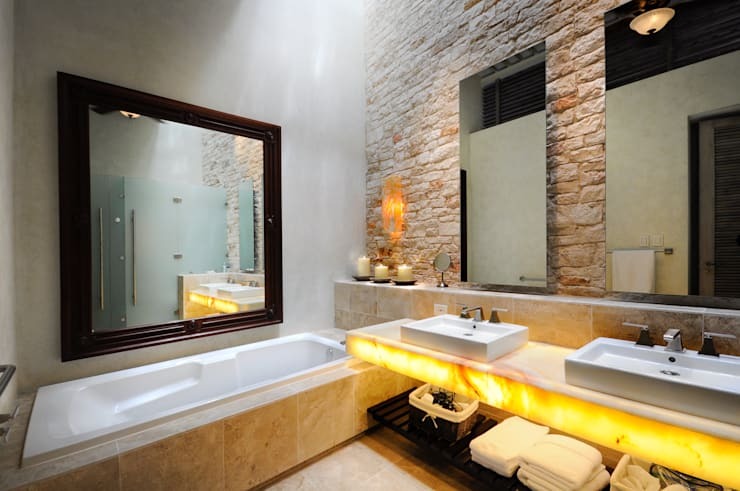 In continuing the fantastic commitment to texture, the bathroom treats us to an entire wall clad in stone, located right behind the modern and sleek mirrors to produce a memorable contrast. Dusty beige tiles and surfaces finished off in crisp white complete the inviting look here, while the sink counter is lit from within for an otherworldly feel. And for a snug factor, candles, wicker baskets and soft towels are added into this unique space. This perspective allows us a prime view of how the living space is suitably merged with the kitchen and lounge. This ensures and open and inviting ambience which goes terrifically well with the eclectic feel of the décor and furniture. For the two teenagers in the house, the designers have conjured up a beautifully vintage bedroom that also presents a fair amount of rustic style. A couple of wooden benches stand at the foot of the beds for a distinctly rural feel. 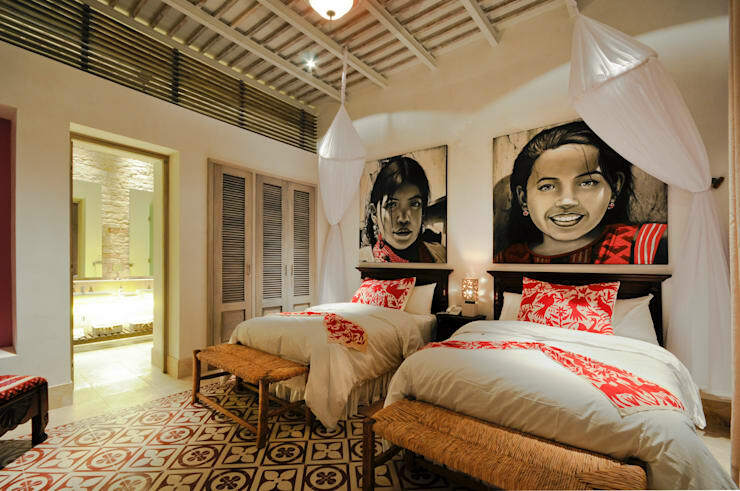 And the warm splashes of red on the large artworks, as well as the bedding, lend both colour and life to this room. All the texture, pattern, beauty and lavish comfort we’ve seen so far make a return at the backyard patio, which has been designed with outdoor pleasure in mind. 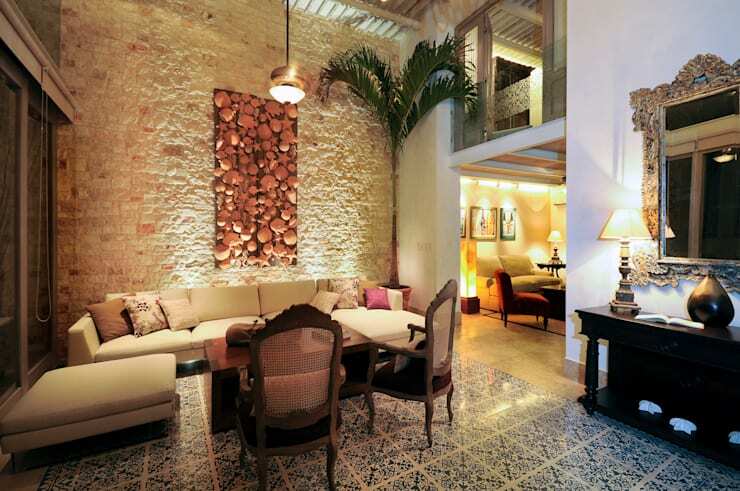 This style is both colonial and rustic, with lush greenery hinting at a tropical feel. A pebbled bed is where we locate the stylish loungers, with a distinct path of stepping stones separating the lounging area from the deep-blue swimming pool. Now for something equally breathtaking; check out The home where island dreams come true. The most beautiful space, or not really your style? Tell us what you think in our comments section.